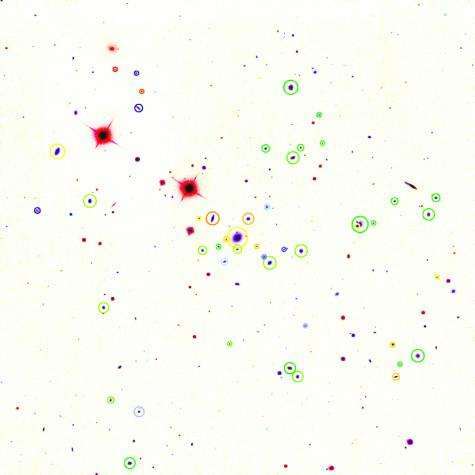 An image of a galaxy cluster discovered in the GAMA group catalogue. This is a inverse colour composite of ultraviolet, visible light and infrared images so redder galaxies appear blue and vice-versa. Galaxies in the cluster are highlighted with circles, with the size of the circle proportional to the mass of the galaxy. The colour of the circle indicates the true colour of the galaxy. In this image a mixture of galaxy types are visible, but very few blue (star-forming) galaxies. The brightest galaxy is located at the centre. Credit: GAMA / Aaron Robotham. 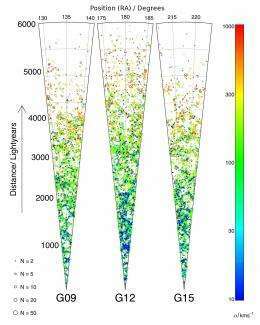 (PhysOrg.com) -- Astronomers from the Scottish Universities Physics Alliance (SUPA) have produced a completely new catalogue of ~15,000 groups of galaxies that gives a new insight into dark matter, the material of unknown composition that makes up a fifth of the mass of the Universe. Dr. Aaron Robotham of the University of St Andrews will present the work of the Galaxy and Mass Assembly (GAMA) team in his talk on Thursday 21 April at the Royal Astronomical Society's National Astronomy Meeting in Llandudno, Wales. Current models of the Universe predict that galaxies reside in large clumps of dark matter, commonly referred to as dark matter halos. Unlike individual galaxies, galaxy groups provide a unique environment in which to study the properties of this elusive material. Understanding the 20% of the cosmos comprised of dark matter is important  in comparison only 3% of the mass of Universe consists of 'ordinary' matter. "The motions of the galaxies inside the groups provide a direct method for studying the properties of dark matter", says Dr Aaron Robotham who leads the group catalogue project. "Studying dark matter in galaxies is confused by normal processes such as star formation, while this unseen material dominates the motions of galaxies in groups." Dr. Robotham describes the construction of the group catalogue, which is a significant improvement on previous similar attempts with much shallower surveys. "The sample has some of the most massive bound structures ever measured. These range from the equivalent of a million billion times the mass of the Sun down to a mere few thousand billion solar masses. To have this range of dark matter halo masses within a single study is unprecedented." The segments show 12-degree wide maps of the positions of the galaxies in the GAMA catalogue. The Earth is at the bottom of each wedge, with the most distant galaxies at the top (at a distance of 6000 lightyears). Circles indicate groups included in the catalogue, where larger circles show groups with more members. Credit GAMA / Aaron Robotham. "Some of our groups contain hundreds of galaxies while others only a handful", says Dr. Peder Norberg, a co-investigator based at the Royal Observatory Edinburgh, "the ratio of the number of very high mass to very low mass groups is a direct indicator of the type of dark matter that the Universe contains. Hot or warm dark matter (meaning light particles) suppresses the formation of low mass halos while cold dark matter (heavy particles) encourages their formation." It will take a further few years of detailed studies, with a large range of models, before a definite conclusion can be reached on whether the new GAMA data and supercomputer predictions (based on the popular Cold Dark Matter model of the Universe) are in good agreement or not. "Currently the differences seen between the model and the data can be understood as limitations in the galaxy formation model used, explaining why intense modelling and further studies are required, and hopefully leading to some exciting new findings in the years ahead with possibly the first new insight into the properties of dark matter particles," adds Dr. Norberg. GAMA team leader Professor Simon Driver of the University of St Andrews and the International Centre for Radio Astronomy Research at the University of Western Australia, says this group catalogue is the first big step of 4 years of data gathering by the GAMA Team at the Anglo-Australian Telescope. "The catalogue will provide the opportunity to study how gravity works over an unprecedented mass range and using data from other telescopes around the world we will shed fresh light on how dark mater helps to turn gas into stars". Supermassive black holes: hinting at the nature of dark matter? Does the sun hold a dark secret? Did 'Dark Gulping' Generate Black Holes in Early Universe? New research into the antigravity antimatter (AA matter) that surrounds the solar system and keeps the planets and sun circling our earth reveals that it must permeate the entire universe. Not only is the earth the center of our solar system but it must also be the center of the universe too. The only solution to this is the so far undetected AA matter. There are several new theories as to what this mysterious substance must be and scientists the world over are devising experiments to determine exactly what it is. On a side note scientist Nicolaus 'the mad' Copernicus published his discredited theory that the sun is actually the center of the solar system, neither it or the earth are the center of universe and AA matter isn't required and doesn't exist. This book is not expected to make the best seller list or go into a second printing. a fifth of the mass ??? how does that compare with 90%+ of all baryoinic matter? ?